The black-footed ferret weighs about 1 kg (2.2 lb). It is a slender, wiry animal with a black face mask and short, sleek fur with a yellow-buff color. The black-footed ferret is usually found on shortgrass and midgrass prairies in close association with prairie dogs, which constitute most of its diet. In addition to feeding on prairie dogs, the ferret lives in prairie dog colonies. It spends most of its time underground in prairie dog burrows, typically spending only a few minutes aboveground each day. In burrows it sleeps, caches its food, avoids predators and harsh weather, and gives birth to its young. While remaining in a burrow the ferret subsists on cached food. The black-footed ferret does not hibernate, but in winter, the amount of time it is active decreases substantially. It is secretive and primarily nocturnal. The female black-footed ferret usually bears 3 - 4 young per litter. The young emerge from the burrow in July and leave their mother in September or October. The black-footed ferret is solitary, except during the breeding season, and males apparently do not help to rear the young. The black-footed ferret originally occurred in the Great Plains from Alberta and Saskatchewan, Canada, to Texas and Arizona, USA. It experienced a dramatic decline during the first half of the 20th century. In Canada, it has not been recorded since 1937. By the late 1970's it was thought to be extinct in both countries. In 1981, however, a colony was found in Wyoming, USA. All remaining black-footed ferrets were captured and sent to a captive breeding center. As a result of the captive breeding program, black-footed ferrets now live at seven reintroduction sites in the USA, including sites in Montana, Wyoming, Arizona, South Dakota, and along the Colorado/Utah border, as well as in Chihuahua, Mexico. Loss of habitat is the primary reason why the black-footed ferret declined almost to extinction and why it remains severely threatened. Conversion of grasslands to agricultural uses and widespread prairie dog eradication programs have reduced ferret habitat to less than 2 percent of what once existed. Remaining habitat is now fragmented, with prairie dog towns separated by great expanses of cropland and human development. Diseases, including plague (affecting both the ferrets and their prairie dog prey) and canine distemper, as well as poisoning and shooting, also remain as potential threats. *** The black-footed ferret is one of the world's rarest mammals. *** Baby ferrets are called "kits." *** The ferret's long slender body allows it to slip down burrows to find its prey while they sleep. This reduces the ferret's risk of injury when attacking prey the same size as itself. *** Antipathy towards prairie dogs, the black-footed ferret's main source of food, remains prevalent among some groups, including ranchers and many employees of agriculture, wildlife and public land management agencies (Reading 1997). The black-footed ferret originally occurred in the Great Plains from Alberta and Saskatchewan, Canada, to Texas and Arizona, USA. It experienced a dramatic decline during the first half of the 20th century. In Canada, it has not been recorded since 1937. By the late 1970's it was thought to be extinct in both countries. The captive breeding program and reintroduction of ferrets has slowly rebuilt the population to about 500 in the wild (Focus 2005a) . The black-footed ferret is usually found on shortgrass and midgrass prairies in close association with prairie dogs. When inactive, it occupies an underground burrow made by a prairie dog. Both male and female ferrets become sexually mature at one year of age (Black-footed Ferret Recov. Prog. 2005) . 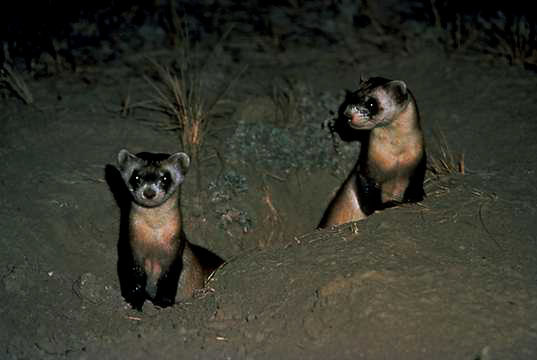 41 - 45 days (Hammerson et al./NatureServe 2005, Black-footed Ferret Recov. Prog. 2005) . The average litter size is 3 - 4 young, but single kits, as well as litters of up to nine or ten kits, have been recorded (Black-footed Ferret Recov. Prog. 2005) . In the wild, litter size in South Dakota averaged 3.5 (range 1 - 5) and in Wyoming averaged 3.3 at emergence from the birth burrow (Hammerson et al./NatureServe 2005) . The interbirth interval is 1 year (Ferguson & Lariviere 2002) . The peak reproductive period of male and female black-footed ferrets lasts about three to four years (Black-footed Ferret Recov. Prog. 2005) . Few black-footed ferrets live beyond 3 - 4 years of age (oldest - at least 8 years old) in the wild and 8 - 9 years (oldest - at least 11 years old) in captivity (Ferguson & Lariviere 2002, Black-footed Ferret Recov. Prog. 2005) . The black-footed ferret is secretive and primarily nocturnal. It is thought to have keen senses of hearing, smell and sight. The wild population near Meeteetse, WY, USA, consisted of 67% juveniles and 33% adults each August (Nowak 1999). The ferret is territorial (Black-footed Ferret Recov. Prog. 2005) .